Sweetbreads to invoke that Fear Factor? Dream dish of gooseliver pate - scrumptious! Step into Le Bouchon and you'd be magically transported to the French countryside - the outlet's homey discreet and cosy décor has all the trappings of a small provincial eatery that reflects the Gallic roots of its proprietor and chef de cuisine Philippe Le Francois. Le Bouchon is known as somewhat of an institution amongst discerning diners for its traditional, well-cooked French dishes. “We have a very strong, loyal clientele who like our specialities - hearty, rustic dishes that French people eat on a daily basis and not the nouvelle cuisine dishes that the rest of the world presume we eat. There is a big difference,” said Monsieur Le Francois. He continues: “The French provincial atmosphere here reminds our guests of the warm hospitality and charming countryside in France. While our food and wine may have the fine-dining approach, local diners are made to feel at ease by our experienced staff. 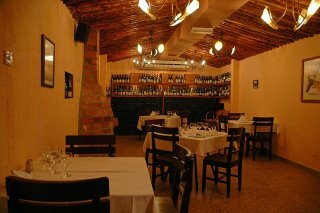 They are always happy to help diners who are unfamiliar with French food with some recommendations." The quality of food here is proudly held up by an all-Malaysian kitchen team under the owner's guidance. “We offer many timeless, classic dishes that diners expect of a typical French restaurant. Some are modified slightly but subtly to accommodate our guests’ requirements and ensured originality of taste is maintained. 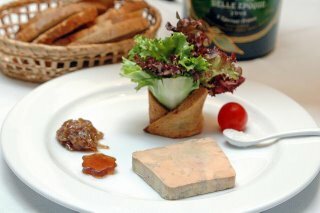 Personally I’d highly recommend Les Escargots De Bourgogne (RM30++) and La Terrine De Foie Gras (RM48++). The Burgundy snails were notable for its accompanying creamy spinach sauce. Smooth and luxuriant, the homemade goose liver terrine is lifted to greater heights by the subtle, caramelized sweetness of the onion jam. Spread onto toasted sour dough bread slices, it is hard to stop at just one slice. Other gourmet options to start with include Pan-fried Goose Liver served with Grape and Apple Glace, Roasted Unpasteurised Goat Cheese with Honey, Mixed Salad and Sautéed Apples, and the ultimate Russian Beluga Caviar with Toasted Canapés, Sour Cream, Chopped Onion and Egg. I chose Grilled Triple Candied Rack of Lamb Provencale on Light Mint Glaze (RM78++) for the main course while my partner accepted the chef’s suggestion of Poached Seabass Fillet and Prawn Brochette with Smoked Salmon and Dill Sauce on Tagliatelle (RM98++). The lamb was cooked to medium doneness as requested but it was surprisingly quite tough to cut. However, I liked the crisp, outer crust of mustard and breadcrumbs. Happily the fish fared very well and it has nothing to do with the precious pearls of Beluga caviar on top. Having sampled two mouthfuls of the exquisite creation, my partner cleaned out his plate despite him not being a great fish fan! 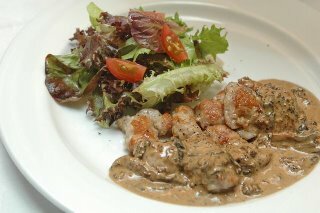 Again if you are one of those who enjoy exotic stuff, try the Braised Ox Tongue with Gherkins, Mushrooms and Madeira Sauce (RM68++). 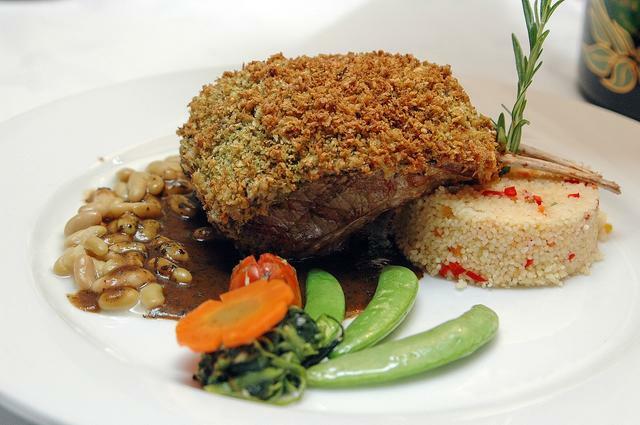 Equally popular amongst Le Bouchon’s regulars are the Sirloin of Beef with Tarragon and Butter Sauce, Crispy Salmon Escalopes and Beef Fillet topped with Sliced Pan-fried Goose Liver and Sautéed Perigord Winter Black Truffle. Dessert comprised Mouelleux au Chocolat (RM32++), a decadent chocolate cake with a molten Valrhona Chocolate centre accompanied by a scoop of Vanilla Ice-cream. 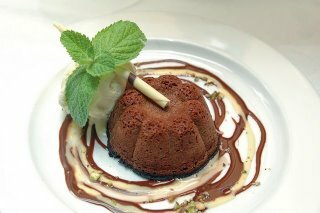 It is advisable to order this at the start of your meal as the kitchen team needs at least 20 minutes to whip up this sublime dessert. Caramelized apple tart, crème brulee, poached pear William in red wine, flavoured chocolate sponge cake and mascarpone, chocolate profiteroles and crème brulee make up the remaining sweet treats. 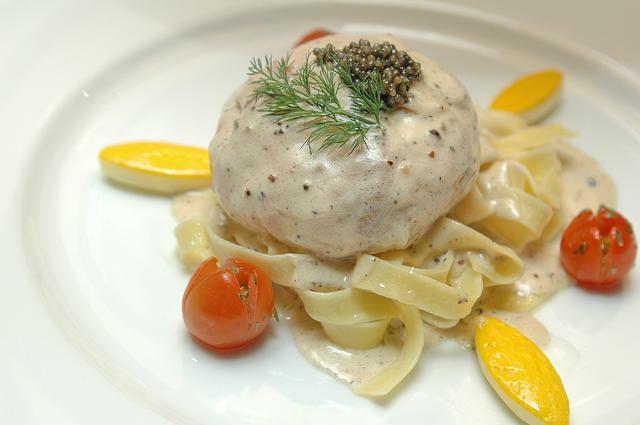 Le Bouchon’s full á la carte menu undergones changes every few months whilst weekly specials for both food and wine are also offered via a four-course Gourmet Menu (RM148++) and a three-course Menu Terroir (RM108++). The staff here is warm and friendly, and knowledgeable about the many specialities served. A special menu will be available at Le Bouchon to commemorate the forthcoming French national day on July 14. Known as Fête nationale or 14 Juillet in France (generally referred to as Bastille Day in English), colourful parades are held during the day followed by magnificent fireworks at night. But as noted by Le Figaro, France’s renowned newspaper, throughout France "people feasted a lot to honour the Bastille". Oui, food is indeed part and parcel of life – in France, it’s synonymous with the good life. Aiyoh - 50 bucks for a starter, 100 bucks for a main and 40 bucks for dessert?? Did you feel like it was worth the price?